Internet Explorer provides various messages when it loads mixed content pages. 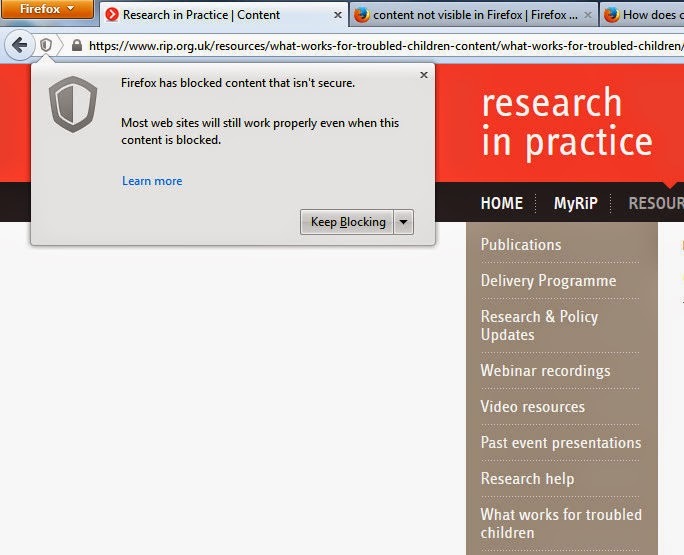 Users may need to select the option "allow blocked content" when prompted at the bottom of the page. Firefox puts a more cryptic shield icon in the address bar. 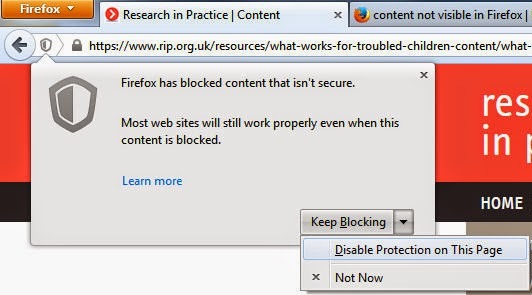 When you see this shield icon in the address bar, it means that Firefox has blocked content it suspects is insecure on the page you're visiting. Click the shield icon in the address bar and choose Disable Protection on This Page from the dropdown menu (click on the image to see it full size in a new tab). The icon in the address bar will change to an orange warning triangle to remind you that insecure content is being displayed. The Chromium browser handles things in a similar way, with the shield icon on the far edge of the address bar. Clicking on this opens the more cryptic warning about 'unsafe scripts'. In this case you can click on Load unsafe script which will allow content to load onto the page.